Across the C-Suite, keeping pace with accelerated technology innovation is high on everyone’s to-do list. That’s why, for many companies, digital transformation begins with embracing a services model. Whether for the entire enterprise or for a specific application or process, service providers offer many advantages. Several services vendors specialize in a particular area, and few offer an end-to-end portfolio of best-in-class solutions for complete coverage of all scenarios. To fulfill their needs, many organizations are embracing multisourcing — a model that allows companies to choose the right set of solutions across a variety of vendors. But it’s not always a straightforward process. “When it comes to governing and integrating services in a multisourced engagement, tackling issues can be challenging as multiple providers tend to focus on placing the blame, rather than identifying the root cause,” writes Paola Arbour in Uncover the Potential of Multisourcing with Service Integration and Management — an analysis paper from Dell Managed Services. First and foremost, a company should consider the level of data the SIAM provider can deliver as well as an analysis of the governance and reporting. 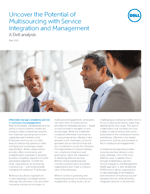 A leader in SIAM, Dell has a proven approach to delivering and managing services using industry best practices. In fact, we were early adopters of ITIL, and our processes were developed through years of experience. We have custom tools, ITIL-based processes and the expertise to deliver a unique SIAM approach for every engagement — tailored to the specific needs of our customers. Our processes help: decrease operating costs, improve service availability, increase control over service providers, enhance IT flexibility and responsiveness, and reduce risk and improve governance and compliance. Enterprises are embracing multisourcing—and fundamentally changing the traditional IT landscape. Multisourcing allows organizations to take advantage of multiple service offerings that decrease costs and utilize innovative industry technologies. While this model lets companies effectively customize an IT outsourcing service offering, it also presents some challenges. This white paper provides an insight into the Service Integration and Management (SIAM) function and how organizations can benefit from the flexibility and innovation of multisourcing and standard services, while delivering integrated services to the business.